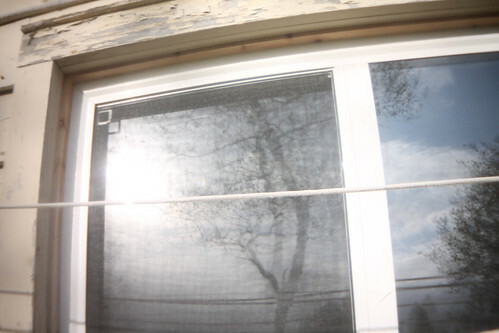 I took this picture with my Holga fisheye lens attachment (from my film Holga) attached to my Digital Holga Lens. I'm not sure why I'm drawn to this photo so much... To me, there's nothing technically good about the composition or the color. But, I think I like the slightly rounded distortion of the window from the fisheye lens, and the two different ways the window has reflected the background behind me. Maybe it's interesting because of the different ways the physical objects in the photo are altered? We have the ability to change the way we see the world; we have the power to create our own reality. What are you going to see today? I love Gibran's quotation which goes so well with what you saw in this unusual photo you took with your Holga fisheye lens attachment! That's a cool photo! I'd like to get a fisheye lens to play about with.